Knight Capital's shares are down more than 75% following its $440 million trading glitch. It hasn't been business as usual for Knight Capital since a massive software glitch in August nearly felled the 15-year old trading firm. Knight Capital is now weighing offers for individual business lines and hasn't ruled out a sale of the entire firm. According to an email sent by Knight Capital's CEO Thomas Joyce to employees on Saturday that was obtained by CNNMoney, Knight said the company will only consider a sale if the terms are right. "There is no need for Knight to pursue a partnership, transaction or any other undertaking. We would only move forward with such an initiative if it makes strategic sense for our shareholders and our business," Joyce wrote in the email. Shares of Knight Capital (KCG) jumped nearly 20% Monday, as investors weighed reports of a potential deal. Whether or not Knight can finalize a sale, the firm is widely expected to restructure its business in the coming months and cut a large amount of its 1600 employees, according to several analysts. 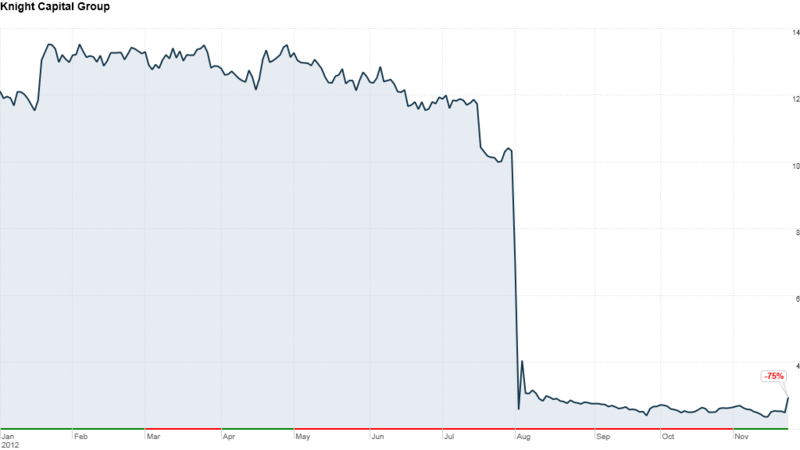 "Whether someone comes in and buys Knight or if there's a scenario where nothing happens, there has to be a sizeable restructuring of the company to improve the profitability of the business," said Chris Allen, an analyst at Evercore. Knight could fetch roughly $1.1 billion in a sale, Allen estimates. Nearly all of the value would come from its electronic trading business Hotspot and its market making business. Knight spokesperson Kara Fitzsimmons declined to comment on a potential sale or layoffs. Knight's institutional stock trading division, which accounts for roughly 41% of Knight's revenues, has been unprofitable in recent years. Potential buyers are expected to dismantle that unit shortly after buying it, analysts said. And even with Monday's pop, shares of Knight are down 75% in 2012. Following the trading glitch, Knight was forced to launch a frantic bid for capital. A consortium of companies, including TD Ameritrade (AMTD), Blackstone Group (BX), Getco, Stifel Nicolaus, Jefferies Group (JEF) and Stephens, put in $400 million to rescue Knight. In doing so, they diluted the trading firm's existing shareholders. Knight has been beset by other issues since then. Its trading volume has dropped. Most recently, in the aftermath of Hurricane Sandy, Knight was forced to reroute trades after a power outage knocked out its computer systems. Knight's newest shareholders are said to have different opinions on how long they want to hold onto their stake in the firm. Allen said that Blackstone and Getco, partially owned by private equity shop General Atlantic, would be more likely to hold onto their investment for the long-term. But Jefferies and TD Ameritrade are more likely to be pushing for a quick sale. Getco and Virtu are said to have approached Knight about buying the company, according to news reports. Getco declined to comment. Virtu did not return calls for comment. Blackstone and Jefferies could consider their own offers Knight, according to analysts. Neither firm returned calls for comment. Knight's competitor Citadel, which made two bids for the company in August, is not expected to put in an offer for the company now, according to a source familiar with the process. Citadel declined to comment. Although Knight is better capitalized now than it was before the trading glitches, investors are still wary. Michael Wong, an analyst with Morningstar, said that "Knight's excess capital is weighing on its returns." But he pointed out that the company needs that extra cushion to prove to its partners that it is on solid financial footing. Knight could be more valuable as a private company, several analysts said. The company could benefit from not having to disclose as much about its finances. Joyce's future at the firm is also at stake. His employment agreement only extends through December 31st. Analysts said that if the firm is sold, the new owners would decide whether or not he should remain at the helm in 2013.